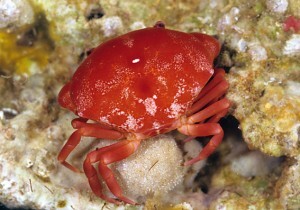 Crabs are the most diverse of all crustaceans in both shape and size. The groups scientific name, Brachyura, means "short tail” and refers to the major evolutionary breakthrough that has made crabs so successful. Instead of using the tail for swimming, crabs have it greatly reduced and tucked completely under their body (carcinisation), and no longer have a tail-fan. This means that they have a much more compact shape, and spend much of their adult lives on the bottom, where they can be much more mobile than other groups. Though some shore crabs can run sideways at great speed, most crabs can move in any direction they choose, belying the popular myth. Considered to have first appeared in the Jurassic (144-213 million years ago), the world fauna is now known to consist of around 7000 species, of which nearly 1000 are known from Australia. The majority of crabs live in shallow water marine environments, but others occupy a huge variety of habitats ranging from deep-sea hydrothermal vents to tropical rainforest, freshwater and even desert. While very important commercially, the crab fishery is dominated by a few members of a single family, the Portunidae which includes mud crabs (Scylla species), and the blue swimming crab (Portunus pelagicus and related species). More than half a million tonnes of of these crab are caught and eaten each year in the Indo-West Pacific region. Convex Reef Crab (Carpilius convexus): Northern Australia, south to central NSW; also Indo-Pacific.